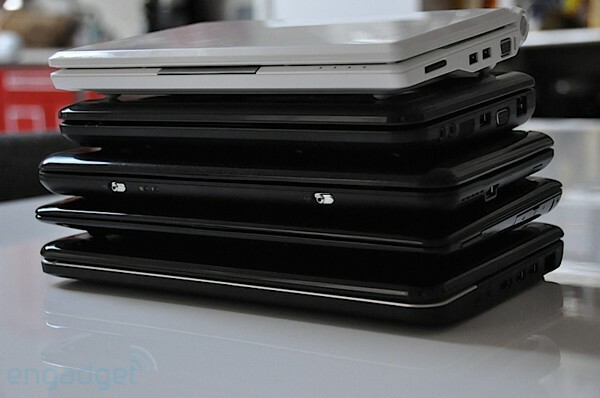 ASUS' Eee PC roadmap leaks: Ion-boasting netbooks, multitouch T91 coming soon? How would you change ASUS' Eee PC Seashell line? We've been seeing plenty of ASUS' newest, and possibly most attractive netbook -- the Eee PC 1008HA Seashell -- around here as of late, and the slim model's gotten plenty of solid reviews in the UK, where it's already available. Nobody can talk about the 'shell (as we refer to it) without praising its handsome exterior, and with good reason, too: even if you're not a fan of a curvy, thinned-out approach, it is most definitely refreshing to see a netbook that doesn't just look like... every other netbook. We decided to take the newest ASUS for a spin, comparing it to the netbook we're friendliest with -- the HP Mini 1000 -- to see how they stack up against one another. Could we swim through the blackened, dark abyss of netbook confusion and emerge with a clearer sense of ourselves? Does clarity come at a cost? Can the 10.1-inch Seashell fulfill all of our netbook dreams? Join us after the break for our musings. First things first: when it comes to looks, ASUS has definitely stepped it up a notch. The stylings have been compared (pretty fairly) to the MacBook Air's shape, with a curved, thinned, and lightened chassis that's just an inch in thickness at its largest point. 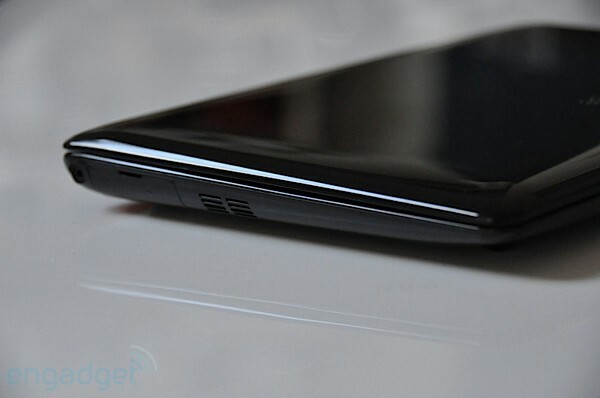 It's got a high gloss finish that makes it pretty smudge-prone, but also really slick-looking. The slimming ASUS has done has practical value, too: the 1008HA is extremely comfortable to hold and carry about in one hand -- whether open or closed -- and though, at 2.4 pounds, it's slightly heavier than our 2.25 pound HP Mini, it feels less clunky in hand. It's also pretty comfortable sitting in the lap, and we noted that this Eee PC is definitely less top-heavy than our Mini, which occasionally almost topples backwards off our knee. For a netbook -- which is all about portability and on-the-go situations -- the vibe that this little guy gives off couldn't get much better. It just feels like it's ready to be popped into a bag (or purse, if you will). 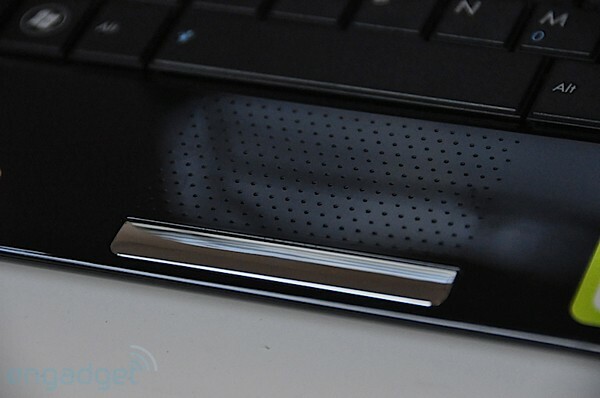 ASUS hasn't spared any expense on little details, either: they've hidden the ports behind teeny doors, so that the Seashell presents a smooth, uninterrupted exterior. When you open it up, the 1008HA continues to be fairly impressive, with a super-comfortable keyboard that's about 92 percent of a full-sizer. The keys have a nice tactile response and some users will no doubt rejoice when they spot an Eee PC first: a full-sized right-shift key. The trackpad is dimpled and has some two-fingered zoom in and out gestures that function as advertised, but that we didn't find to be particularly useful to us. We were also disappointed at the lack of two-fingered scrolling on this otherwise super pad. The chrome rocker is clicky and responsive, and the whole mousing package delivers a lot better than a lot of netbooks (and, in our opinion, way, way better than the Mini 1000). Update: ASUS just let us know that you can in fact do scrolling by dragging your finger along the right side of the trackpad -- a fact that wasn't apparent to us when we were reviewing the Seashell. 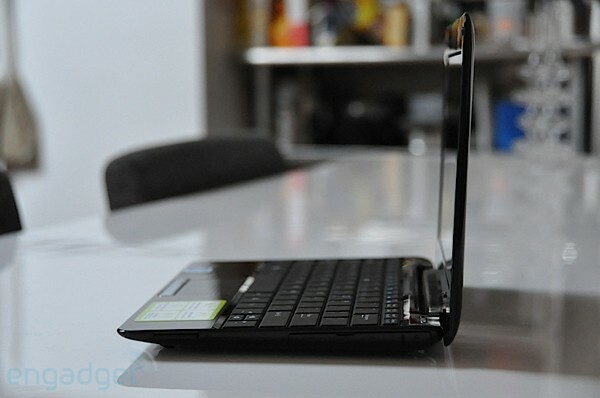 The Seashell boasts pretty standard netbook specs -- 1GB of DDR2 RAM, a 160GB hard drive, and Intel GMA 950 graphics. Its processor 1.66GHz Intel Atom N280 is slightly better than the N270 crammed into most, and to that end, the 1008HA does, in our experience, boot about 20 seconds faster than the Mini 1000 -- 34 and 54 seconds respectively. It has just two USB ports, a standard headphone jack, and mini VGA port (which seems to have been chosen over VGA for aesthetic reasons only), all hidden behind those tiny flaps. To accommodate the lack of VGA port, there's a mini VGA to VGA adapter included in the box, and a dedicated magnetic slot to house it on the bottom side of the chassis, a unique solution to what could potentially be an annoying situation, though ultimately we'd still prefer a full VGA port. We also noted that larger USB keys won't fit into the ports (because of the darn flaps) without an adapter, which can also be a nuisance, especially when away from home. Other than that, the Seashell boasts 802.11 B/G/N Wi-Fi, 10/100Mbps Ethernet, Bluetooth 2.1+EDR, and a high-density, non-removable, lithium polymer battery that supposedly gets up to 6 hours of life -- but more on that in a moment. In terms of performance, the Seashell operates in much the same manner as other, comparable netbooks. It's more than capable of handling everyday tasks -- browsing the internet, streaming video, editing documents, and listening to the Tegan and Sara channel on Pandora radio -- but it's by no means significantly more robust than other portables. As we mentioned, it boots up faster than our Mini 1000, and it also opens documents like Microsoft Word files a bit faster, which is nice as the lag can be grating. The high-gloss screen does produce a significant glare in sunny situations, and though that's pretty much par for the course these days, we found the Seashell's to be even glossier than other glare-inducing netbooks, which could surely be a drawback if you plan on using yours at, say, the beach. We found that with average, continual use, we got somewhere between 4 hours and 15 and 4.5 hours out of that non-removable battery, which is better than a lot of netbooks, and when we tested the 1008HA as recommended for achieving the full six hours of juice -- no WiFi, camera disabled, 40 percent LCD brightness and with power-saving mode turned on, we actually managed to pull about 5 hours and 45 minutes -- pretty close to its advertised life (even if nobody actually uses a netbook that way). Though much of what stands out about the 'shell is aesthetic, its skinnier form factor makes for a more enjoyable user experience. Add to that the excellent trackpad, sweet keyboard, and slightly pumped battery life, and you have a pretty nice package here. The Seashell -- which is obviously aimed at a demographic seeking a higher-end netbook -- is not super-cheap, at $430. Then again, a similarly configured HP Mini 1000 would run you about $414, a Dell Mini 10 would cost about $349, and there are of course myriad cheaper ASUS models to choose from, including the recently outed 1005HA-M (which looks just like the Seashell but has an Atom 270 CPU and some lower-end specs). Ultimately, ASUS has moved the netbook category forward a step; the Seashell is not a cookie cutter portable -- even with its somewhat run of the mill specs -- and for that, we thank it.